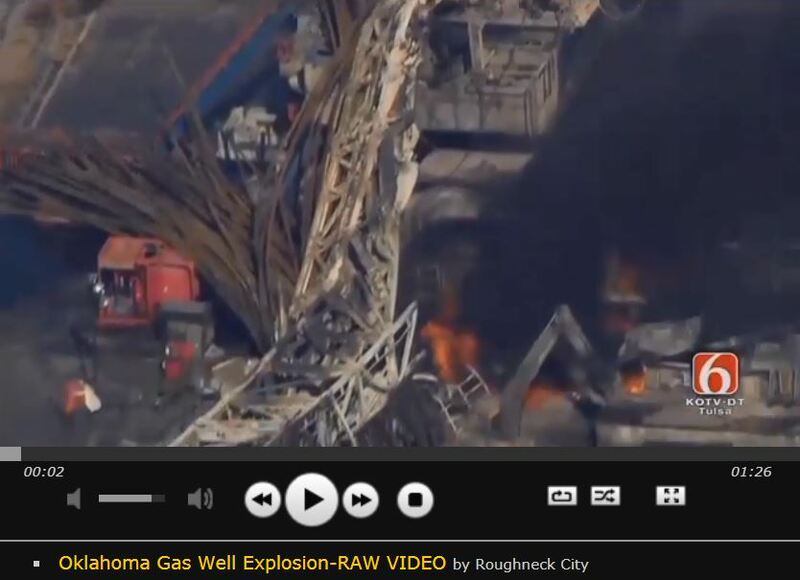 OKLAHOMA CITY — Ten workers have died over the past decade at well sites linked to drilling contractor Patterson-UTI, the same driller involved in this week’s rig explosion in Oklahoma that killed five workers, federal records show. A 2008 report from a U.S. Senate committee described Patterson-UTI as one of the nation’s worst violators of workplace safety laws. The report devoted an entire section to the company and 13 employees who died in Texas rig accidents over a nearly four-year period. Federal and state investigators are working to determine what led to Monday’s blast and resulting fires at the natural gas drilling site near Quinton, about 100 miles (160 kilometers) southeast of Tulsa. An initial incident report indicates there was an uncontrolled release of gas that caught fire and that a worker at the scene tried unsuccessfully to shut down the well. The bodies of the five workers were recovered the next day in the rig’s “dog house,” a room on the rig floor that generally serves as an office for the drilling crew, authorities said. Monday’s explosion and rig fire appear to be the deadliest oil and gas industry accident since 2010, when 11 workers were killed after an explosion on BP’s Deepwater Horizon rig in the Gulf of Mexico that triggered the biggest offshore oil spill in U.S. history. Frank Branson, a Dallas-based plaintiff’s attorney who specializes in catastrophic workplace accidents, said oil and gas operations are inherently dangerous and many companies are lax on safety, especially as energy prices go higher. “We’ve seen a lot of accidents occur because somebody on a crew had just joined the company and didn’t know ‘come here’ from ‘sic ‘em,‘” Branson said. The bodies of five workers who died in a fiery explosion at an oil and gas well site outside of Quinton, Oklahoma were recovered on Tuesday afternoon in a building next to the drilling rig, Pittsburg County Sheriff Chris Morris said. The accident, which followed several fatal mishaps in recent months at Oklahoma oil and gas operations, is the deadliest U.S. drilling mishap since the 2010 Deepwater Horizon offshore rig explosion that claimed 11 lives. The bodies were transferred to the state medical examiner in Oklahoma City, for identification, Morris said. The building was a control operation near the rig. The five included three workers from Oklahoma and one each from Texas and Colorado. The workers had been missing and presumed dead since Monday, when a blast ripped through a Red Mountain Energy drill site, sparking a huge blaze fed by natural gas from the well. The Oklahoma City-based energy producer, which shares management with natural gas marketing and investment firm Clearwater Enterprises, did not respond to requests for comment. Local and company officials said the cause of the explosion has not been determined. The company had begun drilling the well in December. Federal agencies including the U.S. Occupational Safety and Health Administration and U.S. Chemical Safety Board, and the Oklahoma Corporation Commission have begun investigations. Three of Houston-based drilling contractor Patterson-UTI Energy’s employees were among those killed. Officials have not said what company employed the other two workers. Patterson-UTI did not respond to a request for comment. There were 22 workers at the site, which is about 146 miles (235 km) from Oklahoma City, involved in the drilling when the explosion occurred. Officials said 16 got away safely while one was treated for burns and released. The fire was extinguished late Monday. Investigators have been combing the scene for clues to what caused the blast, said Kevin Enloe, director of the Pittsburg County Emergency Management Department. The victims were identified as Josh Ray, 35, from Fort Worth, Texas; Cody Risk, 26, of Wellington, Colorado; Parker Waldridge, 60, of Crescent, Oklahoma; Roger Cunningham, 55, of Seminole, Oklahoma; and Matt Smith, 29, of McAlester, Oklahoma. 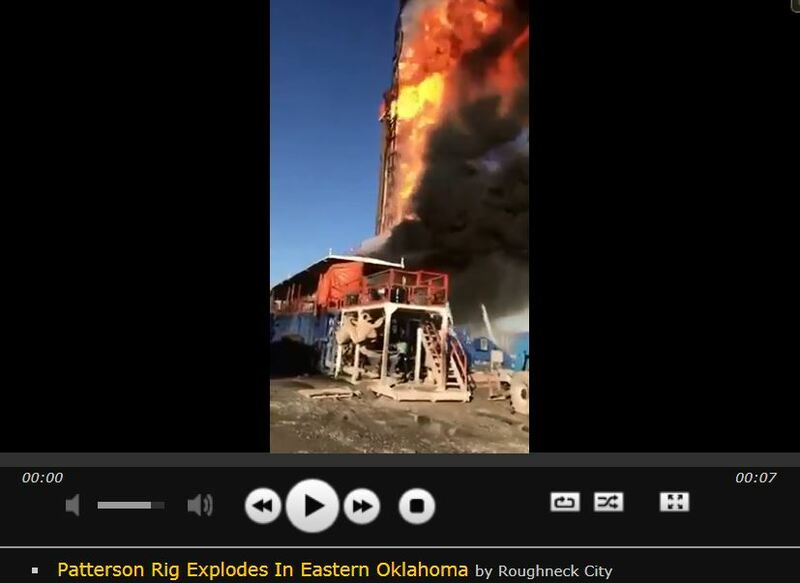 The explosion is the latest in a series of fatal accidents at Oklahoma oil and gas fields. A 40-year-old Oklahoma man was killed in a backhoe accident this month at an oilfield near Ninnekah, another worker was killed last month when equipment collapsed at a site near Preston, and a 36-year-old man was killed in November when a fitting failed during fracking at a well near Watonga, according to media reports. QUINTON, Okla. — Five oil field workers were presumed dead yesterday after a fiery explosion at a gas rig in eastern Oklahoma. The rig belonged to Patterson-UTI Energy Inc., a Houston-based service company with a history of worker deaths. Three of the five missing workers were Patterson employees. The rig was at a well site operated by a relatively new Oklahoma City company called Red Mountain Energy LLC. Authorities were called to the well site about 100 miles south of Tulsa shortly before 9 a.m. local time. Eventually, 16 workers escaped unharmed. Authorities initially said one worker was airlifted for treatment of burn injuries and five were missing. Later in the evening, Pittsburg County Sheriff Chris Morris told local news outlets that the crew members were presumed to be dead and local authorities would begin recovering their bodies. Fire officials said they contained the blaze but decided not to try to extinguish it for fear of spreading hazardous materials and causing other problems. State officials said Boots & Coots Services, a Halliburton Co. subsidiary well known for containing well fires, was summoned to the site. “Secondary explosions” occurred during the day, officials said at a news conference. Patterson-UTI officials said the cause of the explosion and fire was not known. Calls to Red Mountain Energy were not returned. By 6 p.m., the fire appeared to be out and state troopers reopened the gravel access road leading to the drill site. The rig was working in rolling country, about 5 miles south of the Oklahoma Highway 31 in an area dotted with small homes, ranches and well pads. Reporters and other bystanders were kept at a distance, with the drilling rig’s control room just visible above a patch of trees. Trucks carrying oil field and emergency workers rumbled away from the site. Rick Belt, of Poteau, Okla., works for a company that supplies oil field vacuum trucks and answered a few questions through the window of his idling pickup. Patterson-UTI has a long history of fatal accidents. In 2008, a U.S. Senate committee called Patterson-UTI Drilling “one of the worst violators of workplace safety laws.” The Democratic-led panel’s report deemed it an example of the federal government’s “complete failure to check reckless and outrageous conduct” in the workplace. In the preceding five years, 12 of its workers had been killed on the job. Since the report, at least 10 more Patterson workers have died. In 2014, Patterson-UTI officials told the Houston Chronicle the company had been working to improve safety at the company since 2008, investing more than $150 million on training and equipment. The company said at the time that its accident rate was “above average” for the land-based drilling industry. The company has had other workforce problems. In 2015, it agreed to pay $14.5 million in a settlement with the Equal Employment Opportunity Commission on claims of race and national origin discrimination affecting more than 1,000 employees. EEOC alleged that since at least 2006, the company engaged in a nationwide pattern or practice of discrimination on its drilling rigs. That includes assigning African-Americans, Native Americans, Hispanics or Latinos, Asian-Americans, and biracial individuals to the lowest level jobs, failing to train and promote them, disproportionately disciplining and demoting them, and subjecting them to pervasive racial and ethnic slurs, and engaging in retaliation. The company has provided corporate support for an industry safety conference held every two years in Texas. The oil and gas drilling industry has a fatality rate roughly seven times higher than the national average, although the number of deaths dropped sharply in 2016. It also has one of the highest rates of workplace deaths from fires and explosions (Energywire, Jan. 12, 2015). Red Mountain Energy was founded in 2013 by former Chesapeake Energy Corp. geologist Lanny Holman. He was one of 275 Chesapeake employees offered a buyout in late 2012. According to The Oklahoman newspaper, he was contacted within days by Oklahoma City businessman Tony Say, who became one of Holman’s partners at Red Mountain. The company made plans to focus on oil production in the Mid-continent and Permian Basin regions. The Oklahoman reported that the company was backed by Say and Clearwater Enterprises LLC and Jack Golsen, founder and CEO of Oklahoma City-based LSB Industries Inc.
Patterson-UTI confirms that we are responding to a fire at one of our drilling rigs in Pittsburg County, Oklahoma. The cause of the fire is unknown at this time. We have received reports that some of our employees and others are unaccounted for at this time. Our top priority is the safety of our employees and any others who may be affected. We’ve activated our emergency response systems and are fully cooperating with first responders and authorities on the scene. We will provide more details as they are known. Emergency Manager Kevin Enloe said five people are missing in a gas well explosion in Pittsburg County. At least three medical helicopters landed at the site, Enloe said. The explosion took place a little before 9 a.m. The fire is still burning at 11:25 a.m. The rig has collapsed, and there are several fires burning at the site. The rig where the explosion is operated by Red Mountain Operating, also known as Red Mountain Energy. The operating company is based in Oklahoma City, Oklahoma Corporation Commission spokesman Matt Skinner said. Quinton is located about 110 miles south-southeast of Tulsa. About 15 people were working on the rig when the explosion occurred. It is unclear at this time how many people were injured. Uncomfirmed reports this is Patterson Rig 219– we are working to confirm this. Five workers were missing after a fiery explosion on Monday at an oil and gas drilling site in eastern Oklahoma, officials said. The fire had been fed by gas from a well being drilled for Red Mountain Energy by Patterson-UTI Energy Inc, preventing a full search of the scene throughout the day, but was later extinguished, the Pittsburg County Emergency Management Department (PCEMD) said in a statement. not identified by local authorities. “Well control experts and emergency responders are on site and we will conduct a thorough investigation when the incident is fully contained,” Patterson-UTI chief executive Andy Hendricks said in a statement. PCEMD director Kevin Enloe said one of the 22 workers at the site when the explosion occurred was treated for injuries and 16 others were uninjured. The blast occurred at around 9 a.m. CT near Quinton, Okla., about 235 km from Oklahoma City. Boots & Coots, Halliburton’s well control and prevention service, was called in to put out the fire. Staff from the state’s energy regulator, Oklahoma Corporation Commission, were also on the scene, officials said. The explosion is the latest in a series of accidents at oil and gas fields in the state. A gas explosion occurred at a Trinity Resources well in the same area in February 2017, injuring a worker. More recently, a 40-year-old Oklahoma man was killed in a backhoe accident this month at an oilfield near Ninnekah. A worker was killed last month when equipment collapsed at a site near Preston, and a 36-year-old man was killed in November when a fitting failed during fracking at a well near Watonga, according to media reports. [How many workers are killed because of corporate and regulator law violation enabling by Canadian and American courts? 2017 08 04: Fracking by Karve Energy Inc. at Consort Alberta killed Charles Oba, Calgary father of two; Family demands answers. Police not releasing name of the victim. Will Karve Energy blame Charles? 2017 01 04: Happy Alberta-Oil-Patch-Get-Away-with-Murder New Year? After 10 years to investigate and release report, CNRL fined $10,000 – maximum allowed – following regulation violations that killed 2 workers, injured 5 others, 13 in total trapped by devastating tank collapse. All 29 charges against CNRL dropped. Alberta’s “No Duty of Care” energy “regulation” wins & kills, again. Accidents [most greed induced?] during oil and gas drilling claim about 100 lives a year in the United States, according to the U.S. Centers for Disease Control (CDC). Using data from the Bureau of Labor Statistics, the CDC reported 1,189 workers were killed in the 11 years ended 2013, a period of intensive drilling. Deputies in Pittsburg County confirm they are working an explosion near Quinton, Oklahoma on Monday morning about 9:30 a.m.
Officials tell us that about 15 workers were working on an oil rig when it exploded. At least one worker transported to hospital. Officials tell us the explosion happened in a wooded area. Oklahoma Corporation Commission confirms “Red Mountain Energy LLC” out of OKC is the operator at this site. The company confirms this was a drilling rig, however, they are not sure what they were drilling for. To OCC knowledge, they do not believe the OCC has handled anything with this company before. OCC has two people out on the scene dealing with this from an environmental standpoint. State Emergency Management says they have contacted the DEQ and the Corporation Commission because of the type of incident. A viewer who lives nearby says that the explosion happened on a rig in off Bascum road. Several ambulances and there are three life flight choppers waiting. No word on if anyone is injured. QUINTON, Okla. (AP) — Five people are missing after a fiery explosion ripped through an eastern Oklahoma drilling rig Monday morning, sending plumes of black smoke into the air and leaving a derrick crumpled on the ground, an emergency official said. Pittsburg County Emergency Manager Director Kevin Enloe told television station KOTV that at least three medical helicopters landed at the site following the explosion. He said five people were missing. 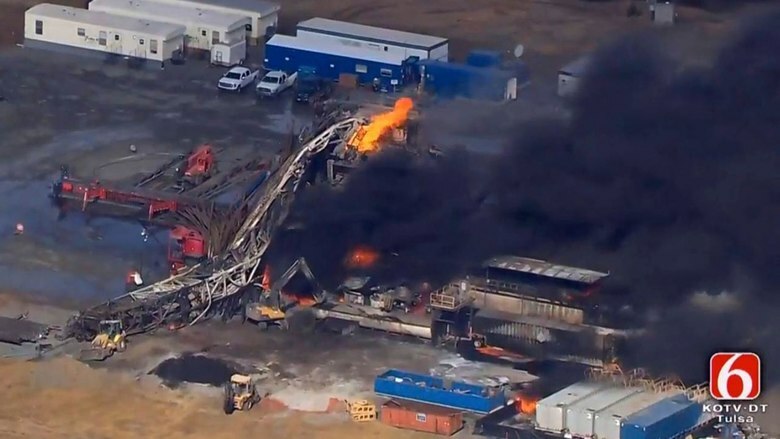 Aerial footage from midday Monday showed several fires still burning at the site and the derrick, a towering metal structure above the well, collapsed onto the ground. The explosion occurred west of the town of Quinton, about 100 miles (161 kilometers) southeast of Tulsa. Oklahoma Office of Emergency Management spokeswoman Keli Cain told The Associated Press that she couldn’t immediately confirm any injuries or fatalities. Cain said state environmental and regulatory officials have been notified and were heading to the scene. A local emergency dispatcher said the sheriff, undersheriff and county emergency management director are all on the scene. The drilling site was being operated by Oklahoma City-based Red Mountain Energy, said Matt Skinner, a spokesman for the Oklahoma Corporation Commission, which regulates oil and gas operators. Telephone and email messages left with Red Mountain were not immediately returned.